Kitchen countertops are a great way to make a statement in your kitchen. Picking the perfect kitchen countertop can really add a “wow” factor to your home.Plus, with so many different styles, colors, and materials used in kitchen countertops today, you can really get creative and choose something beautiful and completely unique to you.At The Granite Guy, we have so many different kitchen countertop choices, we can help your vision for your dream kitchen become a reality. Our granite kitchen countertops are classic and timeless. You can never go wrong with granite. Since no two slabs of granite are the same, we can guarantee that no one else will have your same kitchen countertops.The stone creates a warm and inviting feel. It also looks very expensive, which can be your little secret because granite is really affordable. Granite is a naturally occurring stone; therefore, it has a natural element to it that cannot be copied. It will make your space look luxurious and very high-end. Granite is also very durable.It is heat-resistant, chip-resistant, and water-resistant. 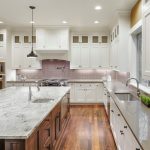 You can feel confident that you can really use your kitchen for some heavy-duty cooking and baking, and your kitchen countertops will still look beautiful and brand new. You do not have to worry about them losing their beauty.Granite comes in many different colors and patterns. And since we have full slabs of granite in our showroom, you can be sure that you are getting exactly what you see in our showroom. No surprises from us on installation day! Quartz kitchen countertops are also very popular. They are sleek and classy. Color pigment can be mixed in with the resin, and quartz flakes can be mixed with polymers and resins, so it is possible to achieve many styles and colors. Metallic and glass flecks can also be mixed in during the engineering process to add dimension and a unique style to the quartz.Many quartz kitchen countertops have metallic pieces in them to add a little bling to your kitchen countertop. What a great way to make a statement!Quartz is also very durable and requires little to no maintenance. Quartz kitchen countertops are stain-resistant, water-resistant, and scratch-resistant. At The Granite Guy, we can help you pick the perfect kitchen countertops to really make a statement and add style and value to your home.Stop by our showroom today!